If there was NO default role set up, or the role was not set to autoactive, a pop up box appears for the New Users notifying them that the administrator will be in touch. They will not be able to login. The Administrator will be sent an e-mail about the new registration. For all New Registrations the Administrator will receive an e-mail from support regarding "New User Registration"
You can send them an e-mail notifying them that you have received their request and their account will be activated in 1-2 hours (which you MUST do) if you did not set up any default roles/groups. Or, you can send them a notification e-mail after you have activated their account and added them to the correct role/group. Default Role: The e-mail will detail whether the New User has been added to any new groups or Roles and whether they are activated or not. 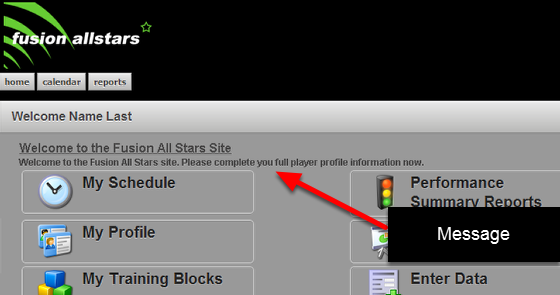 The example here shows the e-mail to the administrator for the Athlete Registration Default Role. This user will be able to login without the Administrator sending through login information. However, you may still want to e-mai them welcoming them to the system and also include any important security or help information. To Activate a User (or Add them to the correct Groups) on the Administration Site search for the new users details (as per your alert e-mail) on the People Page. Open their user account again and assign them to a new role and a new group in order for them to be able to login (that is if they actually require a login). If they were already assigned a group and a role, CHECK it is the correct one. 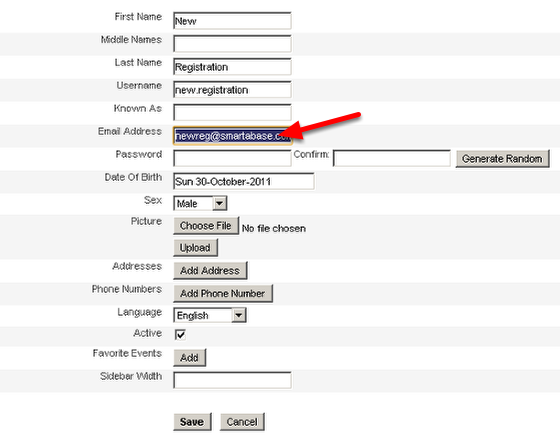 The example here shows that the user has been assigned to an online registration group and an athlete role. You will then need to e-mail them saying that their account has been activated and they can use their username and password that they entered initially to login. While you are on the admin page viewing their details, copy their e-mail address and paste it into standard welcome e-mail that you have for new users outlining data protection information and the like. Please note that you do not have access to their password, so you just send out their username in the e-mail (as shown in the step below). Alternatively, you could use the e-mail and username that you received on the New User Notification E-mail. You should already have a generic welcome information sheet for new users outlining any important information about login details, security, data protection etc. E-mail the user with their account information (copy and paste their username and their e-mail address into the relevant sections) that outlines an relevant data protection act information. If you need help creating this ask your distributor, or look at the Going "Live" with the site chapter in a previous section of this help manual. You could even set up a Message on the Admin Site for the group that the new users are added to so that when they login they have a welcome message on their home page. See the Lesson on Setting up notifications to appear on a Users Home Page when they login for more information about this change. Prev: New Users can now Register for the system on a Registration Page.